“Smooth as honey, with a little bite” describes our new Scottish trio perfectly! Dalwhinnie plays lively Scottish jigs and reels, and smooth strathspeys and airs for your listening and dancing pleasure. Perfect for parties or weddings; please contact us for your Scottish special event. 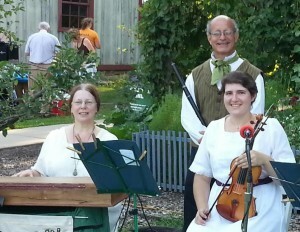 Dalwhinnie is Don Ladig, wooden flute; Sherry Ladig, piano; and Rosa Wells, fiddler.